An Essex depot allegedly linked with the "contaminated" fuel said to have damaged car engines is investigating whether it is to blame. Vopak Terminals says checks are being made to make sure normal handling and storage procedures have been followed. Meanwhile, an AA source told the BBC traces of silicon have been found in petrol taken from the cars. Thousands of drivers have complained their cars were damaged after they used petrol from supermarket forecourts. Tesco said the problems appeared to be linked to forecourts in the south east of England served by a site in Essex. Both Tesco and Morrisons get fuel from an independent oil company called Greenergy, which insists its supplies meet industry standards. A major Greenergy storage depot is run by distribution firm Vopak on the River Thames at West Thurrock, Grays, Essex. Vopak Terminals managing director Colin Scott said: "Verifications are continuing. At this moment we have not established any deviation from normal procedures." An AA source has told the BBC traces of silicon, which should not be in unleaded petrol, have been found in tests carried out by the petroleum industry. It is thought silicon may have found its way into a batch of petrol in transit by ship into the UK or in storage containers. Contamination by water or ethanol has now been ruled out. 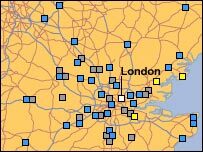 Chris Hunt from the UK Petroleum Industry Association (UKPIA) said: "We have yet to check samples of fuel taken from motorists' vehicles that have suffered problems." "What we are doing as an industry is really getting on as quickly as we can to try and narrow down what the issue is with this fuel that's caused so many problems." He added: "Silicon is one of the many substances we will be examining in the samples we have yet to evaluate, and that evaluation will be going on over the next 24 hours." 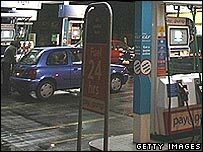 The Trading Standards Institute said samples of unleaded petrol had been taken from station forecourts in Cambridgeshire, Kent, south Essex and Milton Keynes. A spokeswoman said spot checks were also being undertaken by local authority trading standards teams in other parts of the country. Tests on fuel supplied by Tesco, Morrisons and Asda have so far not revealed any problems, the supermarkets have said. The penalty for supplying fuel which does not meet industry standards is a £5,000 fine. The BBC has received more than 3,500 e-mails from motorists who say their vehicles have juddered, misfired and suffered a loss of power. The Association of British Insurers (ABI) said motorists affected by contaminated petrol should be able to claim if they have comprehensive cover. The problems seem to be centred on oxygen sensors which determine the mix of oxygen and petrol supplied to the engine. Garages are running out of replacement parts in some areas as they are swamped with motorists. Repair bills are topping £1,000 for some drivers. The UKPIA said the problem could have arisen because of the way a single batch of fuel was blended or stored, and that petrol across the UK was generally not faulty. Ray Holloway, of the Petrol Retailers Association, said garages had told him the problems may have been around for a week, so the exact cause might not be found. How can fuel become contaminated?